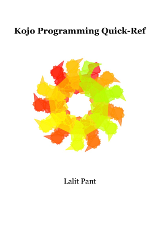 The following is a series of books about using Kojo to play with Computer Programming, Art, Math, and a lot more. Take a read, play along, and have fun! 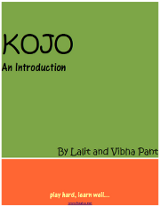 This book introduces children to the Kojo Environment, and gives them a taste of what they can do with Kojo. Math - distances, numbers, ratio and proportion, percentages, estimation, angles, arcs, polygons, coordinate geometry, equations, random numbers, visual and numeric patterns, and more. Art - all kinds of shapes and colors, brought together creatively. Science (Physics) - atomic structure, potential difference, current, resistors, and ohm's law. Programming -- turtle graphics, values and variables, commands and functions, algorithms, primitives, composition, and abstraction. The book also gives children practice with learning how to learn new things using exploration, discovery, and feedback. Purchase the Ebook for $9.99 - and show your support for the Kojo project! Or Download it without buying. To make children familiar with the basic ideas of Computer Programming (and to relate these ideas to Algebra and Arithmetic, where appropriate). To get them to experiment with basic Geometry. To enable them to exercise their creative and logical thinking skills by making nice and colorful computer sketches - using just a few building blocks, and their knowledge of Programming and Geometry. 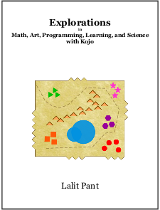 Purchase the Ebook for $6.99 - and show your support for the Kojo project! 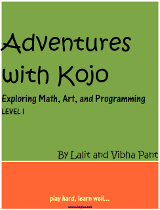 Children who have been using Kojo for a while, and want a concise reference to the ideas, terminology, and useful features of Kojo. Adults who are familiar with programming, and want a quick way to get productive with Kojo. Ebook sales on this page are powered by Shopping Cart by E-junkie.